These five tactics will help you get through a difficult Thanksgiving weekend with your in-laws. The table setting has come together beautifully, your home smells of freshly baked rolls, roasted turkey and savory vegetables, and everything seems to be going according to plan. But when the doorbell rings, you tense up a little bit, either subconsciously or fully aware of the dramatic showdown that could happen in your dining room over the next three hours. Somehow, despite the years of effort you’ve put into smoothing out those complicated in-law dynamics — sometimes bending over backward in the name of peace — the tension continues to surface at gatherings. While one could point to many reasons why in-law relationships are so notoriously difficult to manage, it really boils down to two primary issues: boundaries and expectations. For example, a mother in-law who makes herself at home in her son's kitchen, a father in-law who gives unsolicited career advice, or in-laws who use money to exert control over a couple. These boundaries are typically entrenched after a lifetime together, which means it’s essentially impossible to reconfigure them — hence the struggle. Unmet expectations strain all relationships, but the stakes are high in in-law relationships because they are stakeholders in your marriage. Differing expectations for how to manage things — such as holiday plans, child-rearing, visiting frequency, home presentation, and even work balance — can also contribute to a strained relationship. These unmet expectations, at either end, are a breeding ground for messy emotions, ranging from anger to frustration to sadness. “Unmet expectations strain all relationships, but the stakes are high in in-law relationships because they are stakeholders in your marriage, and your children if you decide to have them, as well as your household and even issues like finances,” says Dr. Durvasula. To help bridge the gap between differing expectations, make sure you and your partner are on the same page, especially on topics that are particularly contentious with your in-laws. While many in-law relationship issues are the result of overstepping boundaries or not meeting expectations, sometimes other factors are at play. Stereotypically and often anecdotally, we see particularly embittered relationships between mother-in-law and her son or daughter in law. Jean, a 58 year old from Indiana who is using her middle name and prefers not to disclose her first and last name for obvious reasons, told NBC News BETTER that she’s been struggling to find a happy ground with her mother-in-law for two decades. Wilson says that she’s received comments from her mother-in-law expressing that she feels like she lost her son. Such feelings aren’t so rare, according to Dr. Laurie Ann Levin, a clinical psychologist with decades of experience dissecting familial stressors. A mother-in-law’s often unconscious fear is that her son has or will forsake her for his wife, preferring her family and her family holiday functions. There are some extreme outliers to consider in regard to complicated in-law relationships, as well. These include widely varying (and excessively vocal) ideologies, mental illness and substance abuse. Minimal, controlled contact is ideal here, though in dangerous situations it may be best to practice complete avoidance. A therapist can help you navigate this more strategically. In many cases, conflict is a two-way street. While you may not be able to smooth things over entirely, you can improve a complicated relationship with your in-laws by starting with the below advice. Stick to neutral topics: If you know of topics that trigger your in-laws, avoid those topics completely. Should the subject come up, divert. A great default topic is how much you love or are proud of their daughter or son. 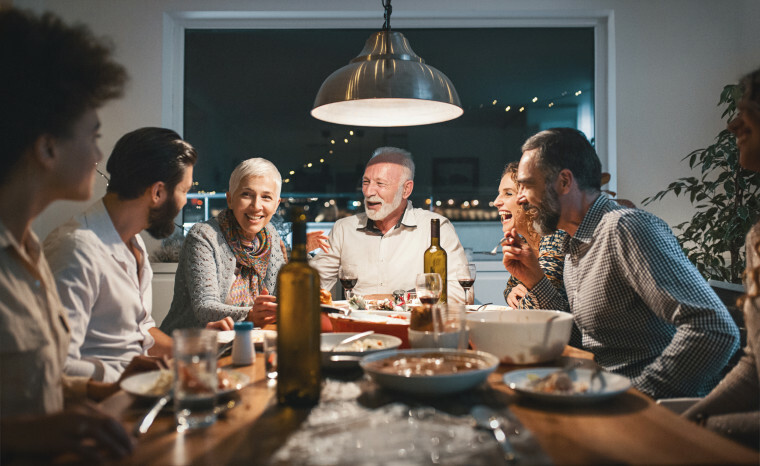 “This is an easy way to connect with your in-law and to set the tone for your interaction for the occasion,” says Dr. Colleen Mullen, a psychologist and family therapist. Come up with a code word. When you have your pre-holiday powwow with your significant other to get on the same page about those "expectations" that come up year after year, Dr. Mullen also suggests creating a code word with your partner. “Using it will signal to them that you are getting annoyed and may need to be ‘rescued’ from the conversation, or that you are just going to step out and get some fresh air,” she says.